The mainstream media, analysts, and the so-called experts are struggling to make sense out of the emerging global protest movements. Recent articles published in major papers like the New York Times, Washington Post, and almost all cable television websites contained an assertion that the protesters are leaderless, goal-less, and fragmented. Apparently, that explains their unenthusiastic coverage of these movements. Politicians from the right have dismissed the protesters calling them “mob,” “ragtag mob,” and “anarchists.” Politicians from the left described them as frustrated youth who want to counteract the Tea Party movement. The same media and politicians did not pay attention to the Arab Spring either. It would seem that the old guard is too slow to adapt to the new reality made possible through communication that is not filtered through special interest groups and powerful individuals. It is true that the new global protest movements are leaderless. In fact, Tunisian and Egyptian dictators were overthrown by movements that no one person, no single party, no organization can claim being its leaders. In fact, the only person who could take credit for igniting the wave of change in the Arab world, Elbouaziz, died before the fall of the first regime. The absence of a single leader makes this movement one of the most democratic movements of the modern time. Their single goal, reclaiming human dignity, is the most unifying force. The so-called fragmentation is in fact the transformative power of diversity. Poor people were told that they have only themselves to blame for not being rich in a free market economy. People were also told that the CEOs deserved the super wages they earn because they do super jobs, because they are men and women of ideas and innovation. But when these same super humans caused the collapse of the world economy, they were bailed out with money that was supposed to be used to help the little guys, the ones thought to be incapable of making decisions for themselves. There is no dignity in a system that pays the many $8.00/hour and the very few $8000.00/hour. These activists are not institutions or corporations and they don’t believe that corporations are people. The real people are the ones who bleed, sweat, tire, fall ill, and feel. Only when corporations can show that they bleed, feel pain and joy, and go to prison when they commit a crime, should they be considered people. 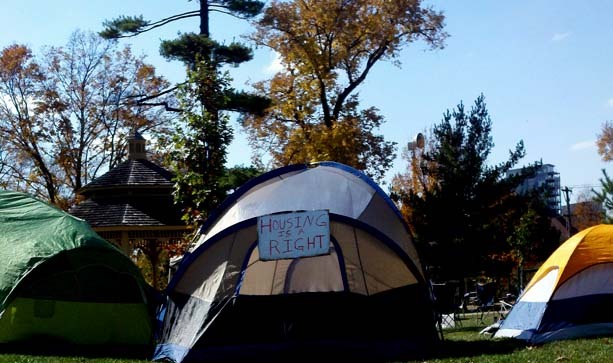 These activists are establishing a new paradigm for social change—peaceful change. They are allergic to corporate money, they are supportive of small and local businesses, they are protective of the environment, and they are peaceful. These are the pioneers of a new paradigm of activism. They are successful because they are not co-opted by political parties or interest groups. They are the global voices for social justice and human dignity. * Prof. SOUAIAIA teaches at the University of Iowa. He is the author of the book, Contesting Justice. Opinions expressed herein are the author’s, speaking as a citizen on matters of public interest; not speaking for the university or any other organization with which he is affiliated. 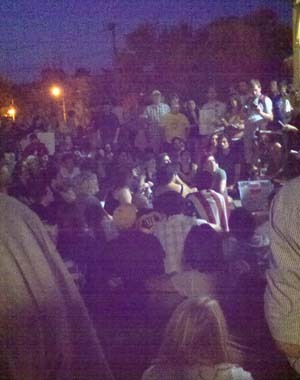 Photos: Occupy Iowa City event, October 7, 2011.